Detail from Fritz Dietel’s sculpture “Tufts” (2006), wood, pigmented epoxy, at Swarthmore College’s List Gallery. Glimpsed through the windows from outdoors, it seems a surreal costume party is taking place at Swarthmore College's List Gallery. Inside, that impression lingers, no matter that the gallery assistant and I are the sole human beings in the room. Fritz Dietel's works in wood and paper, assembled here for the exhibition "Fritz Dietel: 25 Years," appear so animated under the lighting they could be carrying on conversations. One piece that from afar made me think of a hat fashioned from exotic feathers by Elsa Schiaparelli turned out to be one of the earliest works in this mid-career survey. On closer inspection, the 10-foot-long sculpture, Current, from 1993, suggests the movement of long hair or grasses under water, though Dietel does make references to birds in some of his works. Current is composed of narrow strips of oak steam-bent into curved repetitive shapes. It's the most elegant of the sculptures in this exhibition of curvaceous, textural, mainly abstract works. Its presence here, along with 1992's sleek bronze Seed, reveals Dietel's shift away from refinement in his more recent works. Most of the pieces in the exhibit are from the last 15 years, and he now seems to be taking his aesthetic cues more from self-taught folk artists and woodcarvers. Unlike those those two early sculptures, Dietel's later explorations of organic forms from nature allow for humor and sweetness here and there. 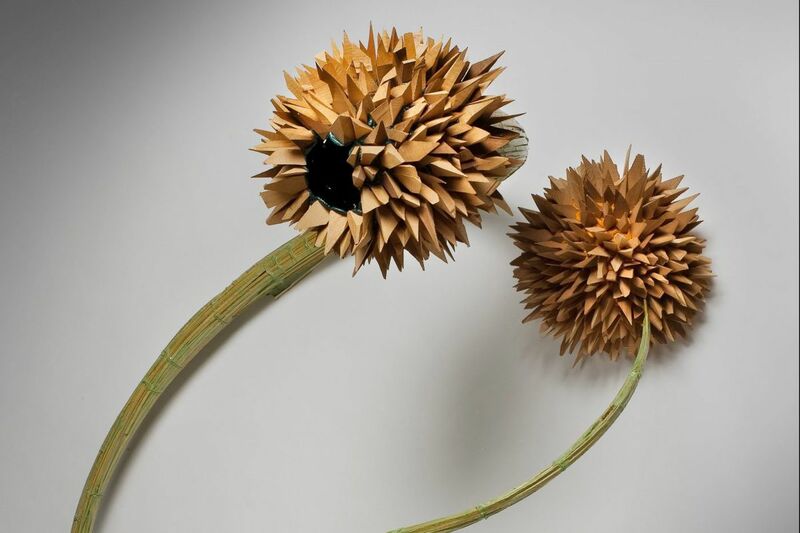 Tufts, made in 2006, could have stepped out of Little Shop of Horrors, with one sinuous stem that sprouts seed-podlike assemblages of wood at both ends. Flicker, from the same year, is a remarkable aggregation of pieces of apple wood held together with generous globs of caramel-colored epoxy. Dietel's fluency with a range of materials is obvious throughout the exhibition, particularly in his use of his own, handmade abaca paper, which he began crafting in his Philadelphia studio after taking a course in papermaking at the Dieu Donné Papermill in New York. Some of these paper pieces are composed of abaca paper draped over foam constructions and then sprayed with abaca paper pulp. Matrix (2015), Hull (2014) and Twisted (2017), three freestanding sculptures that recall beehives, urns, and seed pods, speak to Dietel's mastery of the technique. Their display together brought the party back to mind. Dietel has also been incorporating LED lights into works lately as a means of illuminating their interiors. A mysterious inner glow emanates from Sentinel (2017), a sculpture formed from thin slats of Douglas fir. This new sculpture's refinement and mystery harks back to Dietel's Seed, but it's as light and open as Seed is dark and contained. The List's director, Andrea Packard, surely knew Dietel's sculptures would look right at home in her gallery, whose indoor architecture and outdoor landscape have always struck me as perfectly in sync. But what she has wrought with her guest list is perfection. Through Oct. 22 at List Gallery, 500 College Ave., Swarthmore, noon-5 p.m. Tuesday through Sunday. 610-328-7811 or www.swarthmore.edu. Astrid Bowlby’s “Oven Mitt” (2017), fabric and paint, at the Arcadia University Art Gallery. I've seen several of Astrid Bowlby's solo shows over nearly two decades, at Gallery Joe and elsewhere, and have witnessed the changes in her art — from drawings of tiny flowers that filled space so claustrophobically you expected them to jump their borders to sprawling room-sized installations. So I knew Bowlby enjoyed pushing the boundaries of drawing. But I was still surprised by the adventurousness of her recent work in the exhibition "Astrid Bowlby: When the Shadow Is Not Your Shadow," organized by Marginal Utility for the Arcadia University Art Gallery. There are pieces here that continue Bowlby's recognizably "signature" style, including a Prismacolor and glitter "painting" whose title, The sea is so wide and my boat is so small, is rendered as part of the work — but they're in the minority. Elsewhere, Bowlby seems to be summoning artists to whom she feels a connection. An enormous red oven mitt suspended from the gallery ceiling recalls works by both Claes Oldenburg and Ree Morton. Alternative Marker, an engraved granite block that looks like a grave marker, brings to mind Jenny Holzer. Bowlby's use of repetitive words is especially effective. One colored-pencil wall drawing reads "you would not say that to me if i were not, i would not say that to you if you were not, i would not say that to you if i were not, you would not say that to me if you were not" over and over, taking up an entire wall. It's an apt commentary on the emptiness and lack of genuine connection in social media interactions, as is a sound piece, Blah/me, in which a woman's voice monotonously repeats the words blah and me. In Pursuit of Magic, a wall-mounted pile of crumpled black-and-white photocopies of a found, manipulated photograph struck me as Bowlby's investigation into some personal matter. It is diverting for its intense physical presence. Through Oct. 29 at Arcadia University Art Gallery, 450 S. Easton Rd., Glenside, 10 am. to 8 p.m. Monday through Friday, noon to 4 p.m. Saturday and Sunday. 215-572-2131 or gallery.arcadia.edu. Jack Ramsdale’s photograph “North Philadelphia-Chestnut Hill East” (2017), archival print, Innova paper, at the Philadelphia Episcopal Cathedral. Not all of the shows mounted by the Philadelphia Episcopal Cathedral surmount this vast space and its low lighting. Jack Ramsdale's exhibition, "In Passing," is one of the happy exceptions. Ramsdale's large, richly detailed color photographs of quiet places — in Philadelphia, New Jersey, and Ireland — echo the contemplative mood of the environment. And they stand out as beacons of light. Through Oct. 28 at Philadelphia Episcopal Cathedral, 23 S. 38th St., 11 a.m. to 1 p.m. Monday through Friday. 215-386-0234 or philadelphiacathedral.org.